Nov. 6, 2006: Near the end of the mission of Apollo 16, on April 24, 1972, just before returning back home to Earth, the three astronauts released one last scientific experiment: a small "subsatellite" called PFS-2 to orbit the Moon about every 2 hours. The intention? Joining an earlier subsatellite PFS-1, released by Apollo 15 astronauts eight months earlier, PFS-2 was to measure charged particles and magnetic fields all around the Moon as the Moon orbited Earth. The low orbits of both subsatellites were to be similar ellipses, ranging from 55 to 76 miles (89 to 122 km) above the lunar surface. The orbit of PFS-2 rapidly changed shape and distance from the Moon. In 2-1/2 weeks the satellite was swooping to within a hair-raising 6 miles (10 km) of the lunar surface at closest approach. As the orbit kept changing, PFS-2 backed off again, until it seemed to be a safe 30 miles away. But not for long: inexorably, the subsatellite's orbit carried it back toward the Moon. And on May 29, 1972—only 35 days and 425 orbits after its release—PFS-2 crashed. What happened? The Moon itself plunged the subsatellite to its death. That's the conclusion of Alex S. Konopliv, planetary scientist at NASA's Jet Propulsion Laboratory in Pasadena. He and several colleagues have been analyzing the orbits of various Moon-orbiting satellites since PFS-2, notably the 1998–99 mission of Lunar Prospector. "If the Moon were a uniform sphere, you could have an orbit that was perfect ellipse or circle," Konopliv explained. "The Moon has no atmosphere to cause drag or heating on a spacecraft, so you can go really low: Lunar Prospector spent six months orbiting only 20 miles (30 km) above the surface." So why did PFS-2, which was inserted into an elliptical orbit that originally carried it from 52 miles (97 km) to 66 miles (120 km), end up as a kamikaze blast of broken aluminum struts and solar panels? "The Moon is extraordinarily lumpy, gravitationally speaking," Konopliv continues. "I don't mean mountains or physical topography. I mean in mass. 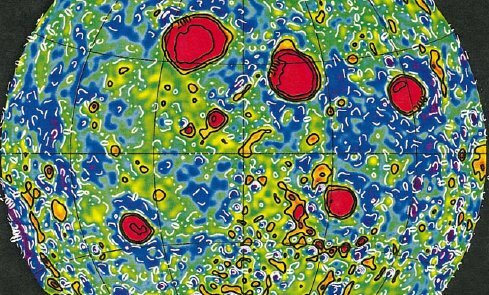 What appear to be flat seas of lunar lava have huge positive gravitational anomalies—that is, their mass and thus their gravitational fields are significantly stronger than the rest of the lunar crust." Known as mass concentrations or "mascons," there are five big ones on the front side of the Moon facing Earth, all in lunar maria (Latin for "seas") and visible in binoculars from Earth. The mascons' gravitational anomaly is so great—half a percent—that it actually would be measurable to astronauts on the lunar surface. "If you were standing at the edge of one of the maria, a plumb bob would hang about a third of a degree off vertical, pointing toward the mascon," Konopliv says. Moreover, an astronaut in full spacesuit and life-support gear whose lunar weight was exactly 50 pounds at the edge of the mascon would weigh 50 pounds and 4 ounces when standing in the mascon's center. Above: Mascons on the Moon that make its gravitational field so lumpy, as mapped by the Lunar Prospector mission, are shown in orange-red. The five largest all correspond to the largest lava-filled craters or lunar "seas" visible in binoculars on the near side of the Moon: Mare Imbrium, Mare Serenitatus, Mare Crisium, Mare Humorum and Mare Nectaris. Image reference: Konopliv et al, Icarus 150, 1–18 (2001). "Lunar mascons make most low lunar orbits unstable," says Konopliv. As a satellite passes 50 or 60 miles overhead, the mascons pull it forward, back, left, right, or down, the exact direction and magnitude of the tugging depends on the satellite's trajectory. Absent any periodic boosts from onboard rockets to correct the orbit, most satellites released into low lunar orbits (under about 60 miles or 100 km) will eventually crash into the Moon. 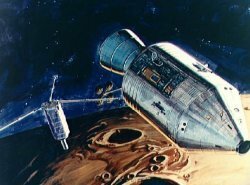 PFS-2 released by Apollo 16 was simply a dramatic worst-case example. But even its longer-lived predecessor PFS-1 (released by Apollo 15) literally bit the dust in January 1973 after less than a year and a half. So what does this mean for eventual lunar exploration? Alternatively, if there are mission reasons for choosing a non-frozen orbital inclination, plan to do frequent course corrections. Lunar Prospector had to do a maneuver every two months to keep itself in its initial circular orbit of 60 miles (100 km)—and more often than once a month when it was orbiting at only 20 miles (30 km) altitude. When its fuel tank was nearly empty, the scientists knew its end was near, so they deliberately crashed it on July 30, 1999, near the Moon's south pole to observe its plume of lunar dust. After a year and a half, the Moon had claimed the spacecraft for its own. Bottom line, says Konopliv: "Carry plenty of fuel." Details about the subsatellites of both Apollos 15 and 16, including their orbital parameters, appear on p. 5-5 of Apollo 16 Mission Report. A paper detailing the weird behavior of mascons on low lunar orbits (of about 100 km altitude) by Alex Konopliv and four coauthors is "Recent Gravity Models as a Result of the Lunar Prospector Mission" published in Icrarus, vol. 150, pp. 1-18, 2001 (available online only by subscription). More about the mascons in the context of the gravitational lumpiness of the moon is "Improved Gravity Field of the Moon from Lunar Prospector," by Konopliv and colleagues. An account of the deliberate crashing of Lunar Prospector into the Moon may be found here.